Experience the Channel Island beauty of Jersey, Guernsey, Sark and Alderney and uncover the delights of Brittany, including Roscoff, Port Clos and Cherbourg, as Hebridean Princess embarks on this wonderful Anglo-French itinerary. When embarkation had been completed we set sail from Portland and anchored overnight in Weymouth Bay. After a morning spent cruising the English Channel, we arrived in Cherbourg for a guided tour of the city. We reamined alongside in Cherbourg overnight. Leaving Cherbourg, we set sail for the Channel Isles, arriving in Guernsey in the late morning to berth in St Peter Port for our afternoon tour if the island and visit to Sausmarez Manor. We remained alongside in St Peter Port overnight. Guests departed St Peter Port after breakfast by local boat for a full day tour of Sark which included a horse and carriage ride and lunch at the Stocks Hotel. 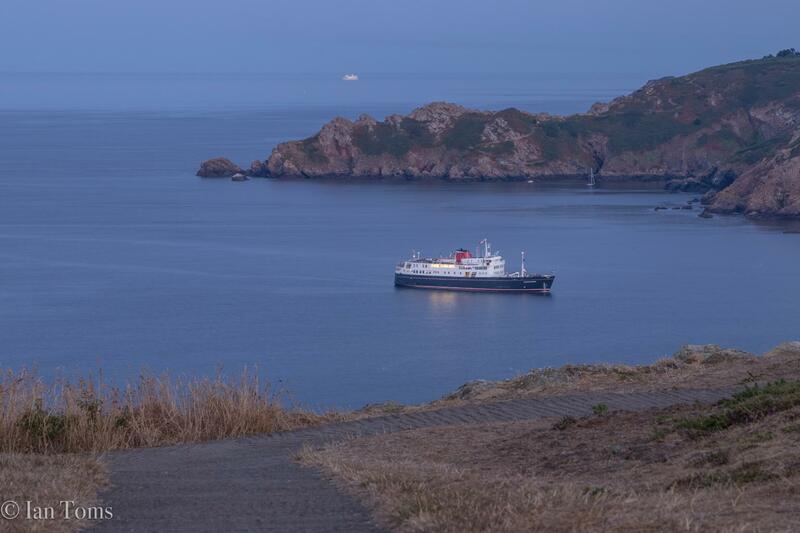 We anchored overnight in Incart Bay off Guernsey and would like to thank Ian Toms for the below image. This morning was spent realxing on board as we cruised on passage to the French coast. We arrived and berthed alongside in Roscoff, where a coach was available to take guests to the ferry for a visit to Ile de Batz. We remained alongside in Roscoff overnight. Guests enjoyed the morning in Roscoff, a city renowned for its architecture, and our tour included the markets. After lunch there was the opportunity to explore Saint-pol-de-Leon with the 13th century cathedral Saint-Paul-Aurelien and the Chapel of Notre-Dame of Kreisker which boasts the highest tower in Brittany standing at 80 metres high. We anchored overnight off St Malo. This morning we sailed through the lock to arrive and berth in St Malo, close to the walled city, from where guests departed for a tour of Cancale and St Suliac. After lunch we travelled to Dinard for afternoon walks on the beach. We remained on the berth at St Malo overnight. After breakfast guests disembarked for a walking tour of the walled city of St Malo. Returning to the ship for lunch there was the opportunity for a little free time in the afternoon for guests to explore St Malo independently prior to sailing to our overnight berth alongside in St Helier, Jersey. Today was spent on Jersey with a morning visit to the Jersey War tunnels along with a tour of the area. Our afternoon was spent exploring Mount Orguiel Castle or St Helier independently. We sailed overnight on passage to Portland. We arrived and berthed alongside in Portland shortly after breakfastand our guide Bryan gave his talk in the lounge regarding our afternoon visit to Athelhampton House. The Captain, Officers and crew waved a fond farewell to our disembarking guests in Portland this morning.